When it comes to the placing of P&I risks, we know that Members and their brokers have several choices. The long tail nature of P&I claims must never be underestimated and therefore the long-term stability of a mutual P&I Club and the partnership forged between the Member and the Club in understanding the risks associated with their individual operations is essential. As many ship owners continue to experience challenging trading conditions, which have resulted in pressure on their operating incomes, it is understandable that focus should be increasingly applied to the stability of operating costs. One such cost is insurance and as Members seek the best value P&I insurance for their operations, we ask them to consider the financial benefits of Club membership. More and more, emphasis is placed on being able to accurately forecast, and therefore budget for, P&I premiums from one year to the next – preferably without ever compromising the level of cover and security offered by an owners existing insurance arrangements. In terms of premium stability, the Club has the most consistent record of all of the clubs within the International Group. The following chart illustrates the cumulative impact of general increases levied across the International Group by individual member clubs. 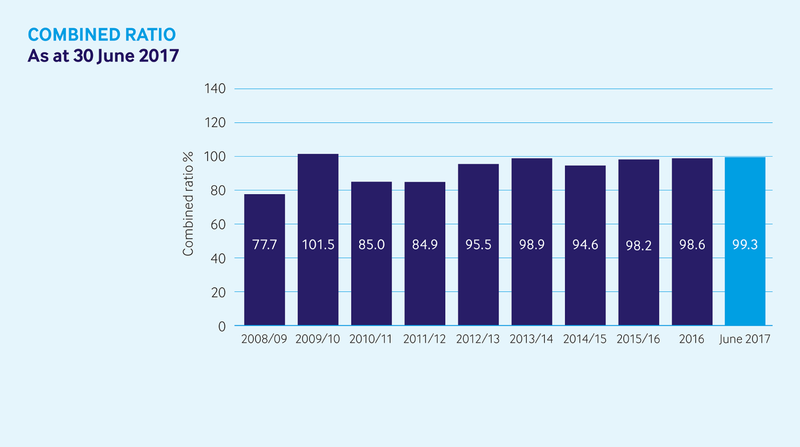 The chart identifies the Shipowners’ Club as having the lowest level of premium increase over the period 2011-2018, with a consistent record of not levying any increase in premiums in five of those seven years. Furthermore, there has been no general increase and the 2018 renewal is the fourth consecutive year without a premium rise. This underlines the Club’s endeavour to only apply premium increases when they are needed, whilst at the same time focusing on the right premium for the risk. The premium stability provided by the Club’s record on general increases is a reflection of the consistently positive underwriting result, as measured by the Combined Ratio record. The Combined Ratio is the sum of net ultimate claims plus operating expenses, expressed as a percentage of the net premium income. As a mutual, and therefore operating as a not for profit insurer, a Combined Ratio 100% is break-even. The Club’s aim is to achieve a Combined Ratio in the region of 95-100%. The chart below shows the Club’s Combined Ratio record up to June 2017 (as reported in our 2017 Half Year Report). The chart shows that over a ten-year period our Combined Ratio averages at 93.4% and over the past seven years 95.7%. This demonstrates the Club’s ability to underwrite to or near a break-even position and that, as a Mutual, the Club is charging premiums at the correct level. Any surplus achieved in the underwriting technical result belongs to the members by increasing the Club’s capital position through its free reserves. The Club’s consistent underwriting results have underpinned the ability to keep general increases to a minimum, and continue to do so in 2018. They also enable the Club to achieve its policy of no Supplementary or Additional Calls. The Club has never made an unbudgeted Call in its 163 year history. It is worth remembering that the Club has for many years been the only club in the International Group to have a policy of no Release Calls. We have long argued against Release Calls and have instead focused our efforts on retaining our membership through understanding Members’ businesses, charging premiums at the right level and providing the highest quality of service at all times. For those Members operating small passenger tour boats, yachts, dry barges, inland vessels and fishing vessels, who seek even greater certainty around premiums and do not require the limits of cover associated with an IG entry, our plain language policies offer the same quality of cover as traditionally associated with a mutual but on a Fixed Premium basis providing complete certainty regarding cost. The Shipowners’ P&I Club has provided a continuous marine liability solution to the owners of smaller and specialist vessels for many years through its mutual approach to risk sharing. We value our strong and loyal membership and while quality growth is important to us, so is the retention of our established membership. As we approach the policy year renewal we must continue to earn the trust that our members and their brokers place in us by providing the financial stability, the highest quality of service and a professional and approachable attitude at all times.